With opening night for the NBA regular season one week away, one storyline that isn’t getting much attention is Kobe Bryant’s pursuit of greatness. Already one of the greatest players of all time, Kobe enters this season with five championships, two Finals MVP Awards, a regular season MVP Award, fifteen All-NBA selections, two scoring championships, and innumerable comparisons to the G.O.A.T. However, one often overlooked career milestone is total points, in which Kobe is fourth, all-time, with 31,700 career points. The all-time leader, of course, is Kareem Abdul-Jabbar, with 38,387 points. With no top-tier teammates this year and in the foreseeable future to share the ball with, Kobe is uniquely positioned to make a run at the points record. However, this past season certainly did not go according to plan for Kobe, who played in only 6 games as he recovered from injury. Now 35 years old, with 18 NBA seasons under his belt, and still recovering from a series of injuries, popular opinion is that Kobe’s chances of catching Kareem are slim. After reading this article, I decided to analyze Kobe’s chances of catching Kareem. Although Kobe is pretty far from Kareem, he’s closing in on Michael Jordan, so I added Jordan’s 32,392 points as a benchmark in the analysis. I’ve also included some of the other leading scorers in the NBA: LeBron James, Carmelo Anthony, and Kevin Durant, to see if they have any chance of reaching the upper echelon of NBA scorers. With just a few weeks left in the regular season, some of us are left without much to root for anymore. HEAT fans remain optimistic in the surprisingly competitive battle for the first seed, and Suns, Mavs, and Grizzlies fans are biting their nails short in hopes that their teams can grab a playoff spot. However, a good percentage of us basketball fans now realize we have little to root for anymore (or if you’re a Sixers fan like me, you realized in about August), and are just waiting to see the final playoff seedings and end-of-season awards before the playoffs get underway. Besides the MVP, one of the most notable awards each year is the Scoring Title. Last season, we were treated with a thrilling ending as the battle for the Scoring Title came down to the wire between Kevin Durant and Carmelo Anthony. This season, Kevin Durant aka the Slim Reaper has made things less interesting, currently scoring 32.2 points per game (PPG) over 2nd place Melo’s 28.0 PPG. 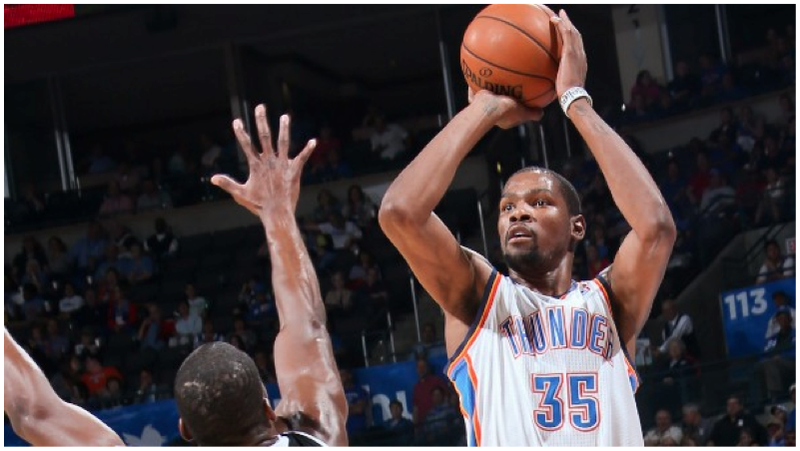 Durant is the only player to average 30 points since he did in the 2009-10 season. The NBA has had a notable drop in scoring lately, a trend first starting when hand checking was instituted in the early 2000’s and extended as many teams have embraced sharing the ball throughout the team in order to better find open looks, namely threes, rather than relying on singular scorers. Durant’s current season widens eyes at first glance — averaging 4 points more than his next closest competitor will do that. But I find that PPG by itself doesn’t tell the full picture. Elgin Baylor averaged over 38 points in 1961-62, but that was over 50 years ago in a completely different league. So who had the most impressive season: 2014 Durant? 1962 Baylor? 2006 Kobe? We’ve witnessed plenty of monstrous seasons, and this study examines them in relation to the rest of the league at the time to contextualize the simple PPG marks. To get a better comparison between scoring performances, we can divide a player’s PPG by their minutes per game (MPG) marks to see how they’re scoring with regard to the opportunities they’re being given. This is especially useful in calculating a league average scoring mark. We don’t want end bench players that average 0.6 PPG to drag down the entire league scoring average, most importantly because they outnumber the talented, 20+ PPG scorers in the league. Dividing PPG by MPG for each player across the league levels the playing field, and also accounts for the possibility that in any given season the league as a whole significantly played more or less bench/low-scoring players for whatever reason (for example, in the ‘60s there were much fewer players in the league and more minutes and points to go around). In terms of points scored per time played, you can see that Durant is not just scoring at an average rate while playing more minutes, he is scoring more efficiently than the players below him on the list (shown by a higher PPM value than his competitors). It’s interesting to note that Melo averages more minutes than Durant, but Durant makes much better use of his time, scoring-wise, than Melo (Durant is also more efficient with his shot attempts – averaging 20.7 field goal attempts per game to Melo’s 21.5). This gives more evidence to Durant’s case for “best scorer in the league” – not only does he have the sheer output, but he also has the efficiency. Next, we’ll calculate the average PPM value for the entire league, and compare each individual player to that average, to see how much better they score than the average replacement. Unlike other studies I’ve done, I haven’t artificially subtracted out all of the players that aren’t contributing much (<20 MPG, <30 GP in previous articles), as using PPM should even out all contributions. This time of year means a few things in the world of sports: March Madness highlights take over ESPN, baseball stadiums start to fill up, and Knicks fans await their inevitable disappointment. This NBA season looks remarkably competitive: the top of the league is crowded with legitimate contenders. The defending champion Heat and the Pacers, although sliding a bit recently, look to be the favorites in a weak East, while the Thunder, Clippers, and an extremely hot Spurs team each look like they could win the West. In order to take a closer look at the playoff picture, we wanted to rank teams according to a metric that took into account various facets of a player’s game, so we decided to calculate a team equivalent of Player Efficiency Rating (PER). We took a relatively simple approach, since PER encompasses a number of basic statistics. Using data for each player over the past four NBA seasons, we weighted each player’s PER by their playing time as a fraction of their team’s total playing time in order to account for a player’s actual usage. Then, we found each team’s Weighted Player Efficiency Rating (WPER) by summing the values for each player on each team. Halfway through the current NBA season, fans have celebrated and lamented the position of their teams as the contenders and lottery teams separate themselves from the pack. On the flip side, NBA stat geeks have begun universally celebrating as the SportVU player tracking system has filled up with an ample pool of data and now possesses a respectable sample size. More than 41 games into the season, we can not only start to project playoff seeding and start pondering matchups, but we can also begin to accept players’ performances so far as an expectation of how they will finish the season as well (barring injury or possible team-afflicting swaps at the trade deadline). SportVU allows us to take a deeper look at these performances, past the simple statlines of points, rebounds, and assists, and really get our hands dirty in finding out what might makes each team and player special. To start, I’d like to revisit my previous article with a few revisions. A reader pointed out that the passing player’s free throws were not being subtracted from the team free throws, so players like LeBron James and Russell Westbrook benefitted from taking many free throws. In addition, it appears that Assist Percentage is a more helpful stat to use than Assist Rate for calculating free throws. The former is simply a percentage created by the amount of field goals assisted by a player out of the total team field goals made, while Assist Rate is a more involved metric that counts assists versus possessions in a game. Lastly, player minutes need to be factored in as well. Team points from free throws are tallied over the entire game, but a player is only on the court for a fraction of the game to assist on those free throws. As a result, we need to multiply the team free throws per game by the fraction of the game that a player is on the court. Here is a comparison of my formula (specified in previous article) compared to the concrete data that SportVU provides this season, using this season’s data rather than the 2012-13 data I used previously. The formula has its flaws, specifically it has a tendency to overestimate the number of free throws catalyzed by a player’s passing. For example, the formula assumes that Chris Paul’s ridiculous 53.8% assist percentage also applies to the amount of free throws shots while he is on the floor. The formula projects him to catalyze 5.8 FTs per game, while NBA.com reports that he only catalyzes 0.9 per game (almost the full difference between his projected points and his contributed points). Overall I believe it still gives a fairly good projection of how many points a player is contributing total. I think that it can still be a valuable tool for getting a picture of players’ contributions before SportVU was available. (Note: AST+ is not available for this season, so I was forced to calculate it myself. A full explanation can be found after the conclusion of the article). SportVU has been tracking two pieces of player data never readily available before: Passes per Game and Points Created by Assist per Game (as mentioned previously). The points are a combination of passes leading to two-pointers, threes, free throws, and passes leading to assists (“Hockey assists”). To get a picture, here are the current top five in Passes per Game and Points Created by Assist per Game (which is desperately in need of a fancy acronym). The 2013-14 NBA season is officially underway, and more has changed than just the Brooklyn Nets and Dwight Howard’s jersey. Last week the NBA owners voted unanimously to return to the 2-2-1-1-1 format of the pre-1985 Finals after 29 years of playing under the 2-3-2 format. This change will take place immediately, beginning with the 2014 Finals. How will the new format affect future Finals series? According to Commissioner David Stern, the format change reflected a sentiment among the teams in the league that the higher seed was not sufficiently rewarded for its better season record under the old 2-3-2 format. They believed it was unfair for the home team to have to play on the road for a crucial Game 5. Over the last 29 years, the higher seed has been down two games to three after Game 5 nine times. When you take a closer look however, this situation has been a recent trend of late. The higher seed in four of the previous eight Finals and three of the last four Finals has trailed the lower seed after Game 5. While the higher seed had home court advantage in Game 6 and 7, it needed to win both games to come out on top. Yet history shows that the lower seed had a slight advantage at this point. 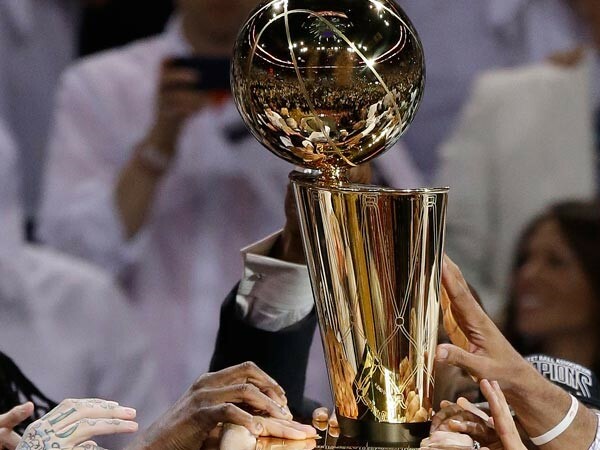 The lower seed ended up with the O’Brien trophy five out of the nine times when it held a one-game lead going into Game 6. Coming out of Kentucky two years ago, we knew that Anthony Davis was going to be good. We saw his freakish athleticism, his dominating shot-blocking, and his offensive potential for the Wildcats, and when the New Orleans Hornets were awarded the first pick in the draft, there was little doubt who they would pick. They were going to pick the guy who does this. Two years later, that pick is paying huge dividends as Davis is leading the Pelicans in one of the more remarkable seasons in recent memory. Today, we break down just how he’s doing it, and why people should be taking Davis more seriously for MVP. We start on the defensive end of the floor, where Davis has been locking down opponents all season. He’s second in the league in blocks, swatting away 3.9 shots per game, but more importantly, he’s doing it in a disciplined fashion, making sure opponents aren’t getting good shots even if he doesn’t block the shot. With the introduction of the new SportVu advanced statistics that the NBA has officially introduced at the beginning of November, I’ve been most intrigued by the new passing statistics now at the disposal of the fans. It’s been well known around stat-heads for a while that Assists are a flawed metric for measuring a player’s contribution to their team. They simply serve as a tally with no weight to them, a cross court pass to an open player in the corner yields the same number of Assists as a pass inside to a big man who does most of the heavy lifting by skillfully posting up. Though some public websites track the number of assists that lead to three-pointers as opposed to deuces, there is still no stat that accounts for passes that lead to free throws, and passers are robbed of rightful assists that they should receive when a play ends in a shooting foul. SportVu will be tracking these statistics, but I’m too impatient to wait for the season to progress and the sample size of SportVu to increase sufficiently, so I set out enumerate the contributions of passers from last year’s NBA season. As stated previously, these assists merely serve as a tally of passes a player completed that led to field goals. We can gain a better picture of each passer’s contributions by taking a peek at a lesser-known statistic called Weighted Assists (shorthand AST+, courtesy of Hoop Data), which weights three-pointers as 1.5 as valuable as regular field goals. From AST+, we can easily calculate the amount of points from field goals that a player produced per game, by multiplying their AST+ value by two.